Ben loves my lemon salmon with dill, but I’d argue this recipe is the best oven baked salmon recipe. It’s so, so, so tasty! 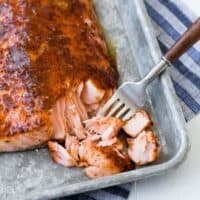 This is actually my mom’s signature way to prep salmon, and it always tastes so amazing, so I knew I had to share with you guys. Neither of us typically prepare this with a recipe (a little of this, a little of that!). It’s a very forgiving recipe, so if you’re decent at eyeballing things, you probably don’t even need to get any measuring spoons dirty. But if you’re not so great at eyeballing things (you know yourself! ), maybe measure just so you don’t think my recipe stinks because you put in 1/2 cup of mustard and 1 teaspoon of maple syrup instead of my suggested amounts. Deal? With that being said, if you want to adjust a little, you of course may do that. Add a little more syrup if you like things sweeter. Add a little more mustard if you want it a little more mustardy. If you like it a little spicy, try adding a touch of cayenne to the mix. Side note: If you haven’t noticed, I love the maple mustard combination. Proof: Roasted Sweet Potatoes with Maple Mustard Sauce, Autumn Quinoa Salad with Maple Mustard Vinaigrette, and Slow Cooker Maple Dijon Ham (also only five ingredients!). 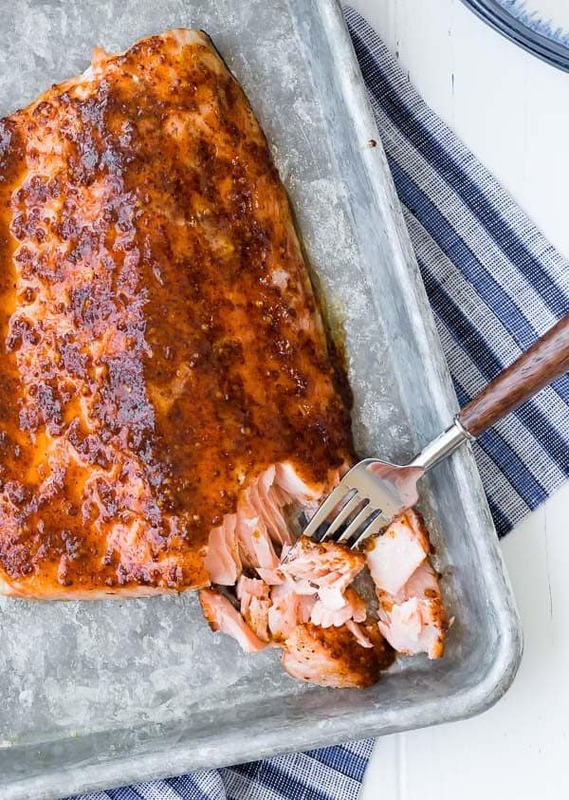 Salmon is so healthy and is really easy to prepare. I used to be intimidated by it, but it really couldn’t be easier. Fun Fact: This recipe is gluten-free, paleo, and grain-free. If you care about any of those things. It’s also just plain delicious. It’s seriously so easy, you guys! I used to be intimidated by cooking salmon, but no longer! I always give my salmon a quick rinse under cold water. It freshens it up a little and makes sure all the loose scales are rinsed off. Next, you want to pat it dry and place it skin side down on a baking sheet. Top it with this glaze, or anything else you’d like to season it with. All that’s left to do after that is to throw it in the oven and bake it! It typically takes about 20-25 minutes at 400ºF or 15-20 minutes at 425ºF, depending on the size of your filet. Preheat oven to 400ºF. If desired, line a baking sheet with parchment paper for easy clean up. 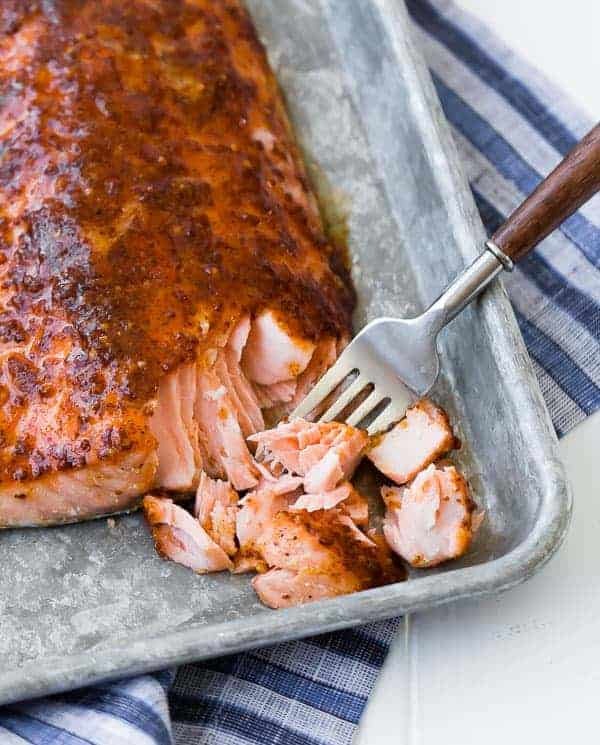 Place salmon on prepared baking sheet. In a small bowl, combine mustard, maple syrup, olive oil, salt, paprika, and pepper. Spoon about half of this mixture over the salmon in an even layer. Bake for 15 minutes. Remove from oven and spoon on the rest of the maple mustard mixture. Return to oven and bake for an additional 5-10 minutes or until an instant read thermometer reads 145ºF and fish flakes easily with a fork. (An internal temperature of 145ºF is my personal preference for salmon, but feel free to cook it to whatever temperature you like!). Enjoy immediately! 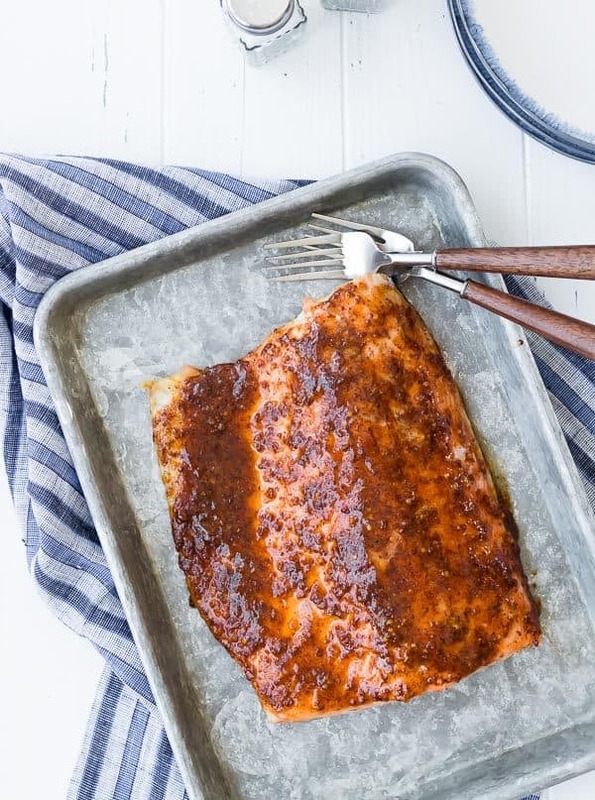 This maple mustard glaze will be enough for up to 3 pounds of meat. 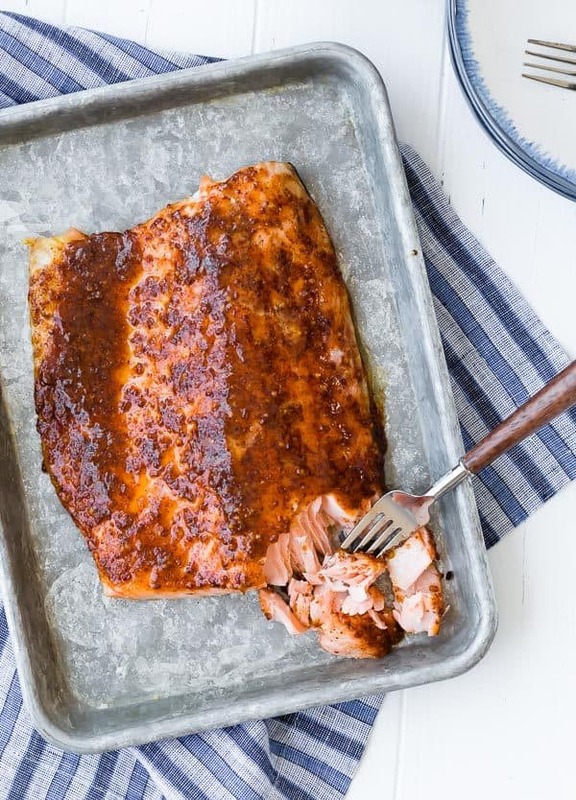 If you are only making a pound of salmon, I’d recommend halving all the glaze ingredients. 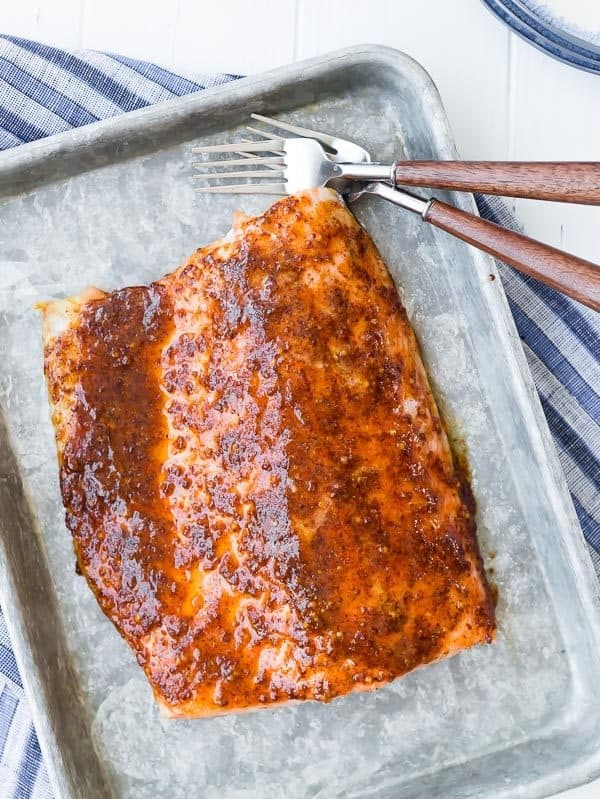 I baked my salmon on parchment paper and then transferred to the pan for the photographs. Verdict: I love this salmon recipe so much. 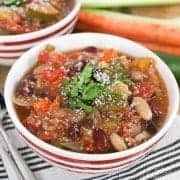 It’s so easy to make, and it’s delicious and healthy. Wins all around. Husband’s take: Ben had no complaints about this salmon! The last time I made it, he raved about it so much, it may have replaced lemon dill salmon as his favorite! Changes I would make: None are necessary, but feel free to adjust the mustard or the maple however you like to make it sweeter or spicier. 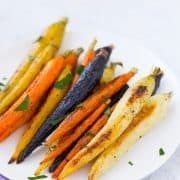 You could also add a touch of cayenne for a little heat. 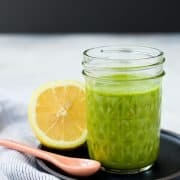 I tried the lemon salad with dill recipe, and I’m sad to say this may have replaced it for me too! Thank you so much for sharing.